This pet is rewarded upon completion of the more difficult version of the Wailing Caverns Pet Battle Dungeon. Players must first complete and turn in Wailing Critters before gaining access to the challenge version of the dungeon. Recklessly rushes into the enemy, dealing 492 Beast damage and dealing 236.4 Beast damage to themselves. Deals 591 Elemental damage split evenly across the enemy team. Avalanche, Thunderbolt, and Thunderclap all do the same thing, it just depends on what cool down you need and how strong. 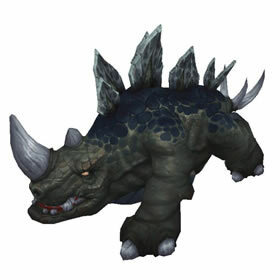 What makes Thunderclap different is that Skum has Roar to increase the main pet's damage by 25%. Stormborne Whelpling however has Call lightning which increases the abilities damage by 25% and also adds the weather effect as well to the mix. Son of Skum is the only pet so far with the Thundeclap ability. If your opponent is a mechanical, thinking they are good versus beast, they have a surprise coming. Thundeclap will deal 219 to each mechanical on the team, and 274 if the beast racial is active. The alternative to the 3rd slot ability is Lightning Shield. If their defenses are shattered after using Stampede, Lightning Shield will cause a mechanical to take 659 if they hit you ... 824 if the beast racial is active. He is so cute, and shiny, and large! I followed XuFu's pet guide for the challenge mode - I had all the pets listed in the guide so pretty straightforward. If you don't have all the pets, you may need to put in a little groundwork first for a smooth run through. Feral Strike + Stoneskin + Thunderclap + Beast racial + High HP = Tank that hits fairly hard. All in all a good pet with a lot of utility. Just got Son of Skum, he's huge and just adorable. I'm quite excited for this pet. Pretty cool looking (I mean who doesn't like a dinosaur for a pet?) and it's a good size pet for once. With a pet biscuit he's as tall (maybe a bit taller) than a male blood elf at his highest point. Nice improvement over a lot of recent ones that are more Sporebat size. He's very friendly, but any amount of snuggles is going to result in you getting a nasty shock.